If Yan can Cook…so can YOU! Martin Yan is one of the first celebrity chef’s I’ve seen on TV and has been a cooking inspiration since I was a kid. I didn’t have cable growing up, so my brother and I were limited to just local and at times static-y channels on TV. After we watched the weekly Saturday morning cartoons and Peewee Herman’s Playhouse, we turned to PBS and watched Yan Can Cook. His shows were entertaining, his knife skills were jaw-dropping and his food looked delicious! These days I can watch Yan Can Cook episodes dubbed in Vietnamese on You Tube. In June. I received a text message from a buddy telling me that Martin Yan was at Costco in Santa Clara. I couldn’t miss the opportunity to see a celebrity chef and one of my culinary heroes, so my girls and I rushed to Costco to see him. Martin Yan was advertising his new line of frozen food products at Costco and provided Costco customers a cooking demo showcasing his amazing knife skills and advertising his new product. It was quite entertaining and brought back memories of watching him on Yan Can Cook as a kid. I picked up his cookbook Martin Yan’s China, got his autograph and took a picture with him and told him that because of him, I can cook too! Kind of cheesy, but so true. This recipe is from his book Martin Yan’s China. The recipe was featured on the cover and every time I picked up the book I saw it, so I just had to make it. 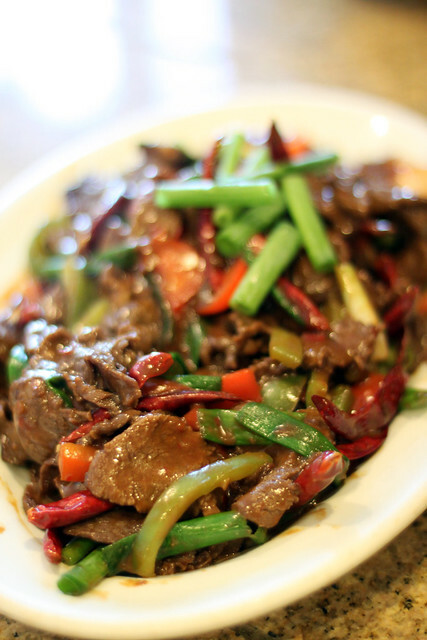 It is pretty darn simple to make and if you love spicy Chinese food, this is a must try! Combine soy sauce, dark soy sauce, Shao Xing rice wine, and cornstarch in a bowl and mix well. Add beef to bowl and coat evenly. Place wok or skillet over High heat. When hot, add oil and add chiles and garlic until fragrant for about 20 seconds. 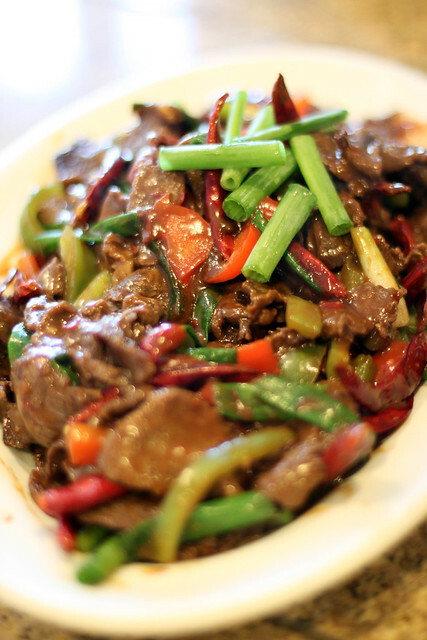 Add beef and stir fry for about 3-4 minutes. Add green onions, red bell pepper, green bell pepper and cook for another few minutes. 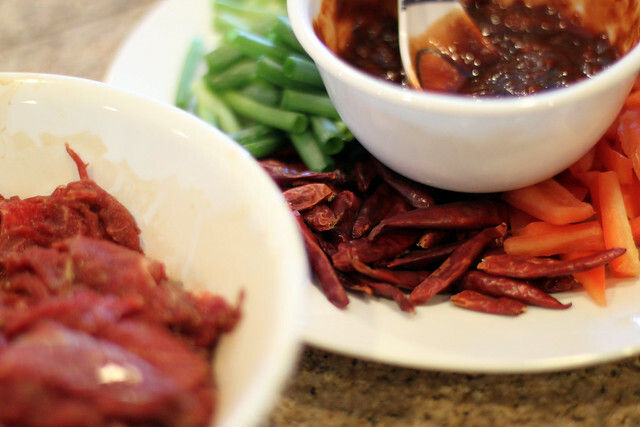 Add chili bean paste and hoisin sauce and toss to coat the meat evenly. Plate and serve over white rice.